In 1990, The late Very Venerable Dabzang Rinpoche made request to H.E. 12th Situ Rinpoche for send the teacher of Jaling from Palpung Monastery, Tibet. As the order of Situ Rinpoche, Lama Tashi Tsewang came from Palpung to Nepal to teach the traditional Palpung Jaling. 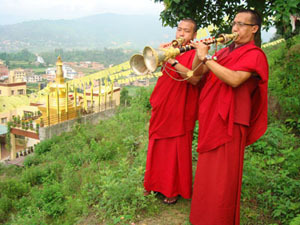 Since 1990, Karma Palzang and Karma Gyurmey have learnt from him and they are very good to play the Jaling. It was recorded in July 2, 2008 at Karma Lekshey Ling Institute; aiming that, in future it will keep remind who knows to play and good to listen for who don't know to play the Jaling.